When it comes to hosting provider InMotion Web Hosting is one of the most robust options in the game. InMotion Hosting’s primary business focus is on hosting for small to medium sized businesses and they’ve been doing so for almost a decade having launched in 2001. InMotion Hosting servers are based on Linux and Unix operating systems and all servers are top of the line systems. In terms of features, they have basically everything you need to get up and running with a new site, or to transfer an existing site. Overall, InMotion Hosting is a solid hosting company ideal for any small to medium sized business or individual. In terms of affordability, InMotion Web Hosting is on the higher end of business hosting packages at $5.00 per month. While this price may seem a bit higher than some of the other web hosting providers listed on this site, InMotion Hosting assures that you get what you pay for and their history of reliable hosting is what makes their price a bargain. In the feature department, InMotion Web Hosting has many of the packages commonly available at most web hosts, but unfortunately has a few glaring holes. While InMotion Hosting does provide options for Python, PHP, and Perl, they unfortunately are absent of support for Ruby on Rails. Also, while 5000 email accounts is a huge number, it seems strange to go that far and not go unlimited. For performance, InMotion Hosting is one of the best in the business. InMotion Web Hosting offers complete 99.9% uptime guarantee as well as free setup and a whopping 90 day money back guarantee. Furthermore, InMotion Hosting offers a 100% satisfaction guarantee which means if you’re not satisfied with your hosting, customer support, or service, you can get your money back. As with performance, InMotion Hosting’s support is really top notch. If you run into any problems with your hosting, InMotion Web Hosting is available by phone, email, and online chat 24 hours a day. On top of that, they have a huge support center offering a knowledge base of common questions and a forum where you can get help from fellow InMotion Hosting customers. Getting going with InMotion Hosting could not be easier. In addition to the industry standard cPanel administration system, InMotion Web Hosting offers several other alternatives in case you’re familiar with something else. Equally impressive is InMotion Hostings many options for protection of your data including critical backups and redundant power to keep your site going all the time. 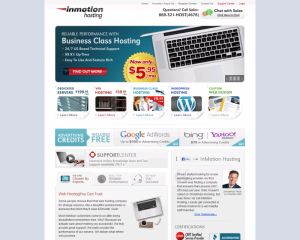 Overall, InMotion Hosting is a truly excellent web hosting provider. Built specifically around solutions for small to medium sized businesses InMotion Hosting has the fundamentals down pat with great support, performance, and ease of use. Unfortunately, we would have liked to have seen a few more features available as well as pricing that is slightly more in line with other hosting providers. In the end though, InMotion Web Hosting is a quality host for anyone needing web hosting.